Prices of naengmyeon, or cold buckwheat noodles, soared this summer following the continued popularity of the dish amid the sweltering heat, as well as a cold noodle craze sparked by the inter-Korean summit in April. According to Statistics Korea, prices of naengmyeon at 148 restaurants across the country went up by 4.5 percent and 4.3 percent in June and July, respectively, compared to a year ago. The increase in June was the biggest since March 2012 when prices rose 5.3 percent. Particularly in Seoul, naengmyeon prices went up by 7.6 percent and 6.3 percent, almost double the average price increase nationwide. During summer, demand for naengmeyon peaks as the icy cold beef broth makes for a refreshing dish. Another form of the dish is served in a sweet-spicy sauce. 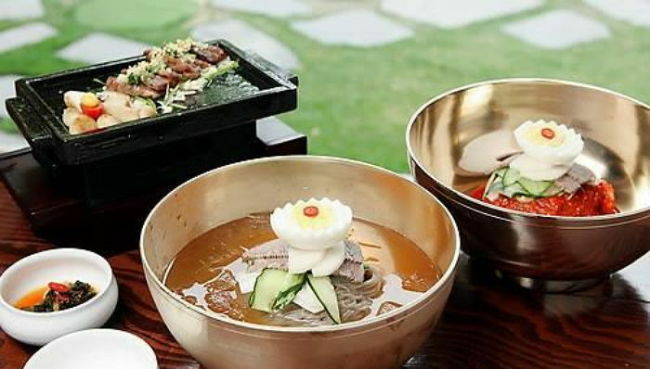 The Pyongyang version of the dish gained popularity after North Korean leader Kim Jong-un brought chefs from the North to cook the noodles at the venue of the inter-Korean summit in April. Long queues formed outside well-known Pyongyang naengmyeon restaurants in the South, and the dish trended on social media at the time. Statistics officials said the heat wave this summer has contributed to the price increase, with many diners eating naengmyeon to beat the heat.